Yale’s Personal Story | Hauptman and Hauptman, P.C. When I was a young child, my grandparents were very involved in my life. After moving to New Jersey at age 2, we continued, for many years, to return to Brooklyn on weekends to visit both sets of grandparents. My paternal grandfather died when I was 12 and my Israeli grandmother, Imma, alternately lived with her 4 children for several years, until settling permanently with us. My maternal grandparents moved from Brooklyn to New Jersey when I was 14 and lived a ½ mile from our home. My grandfather died a few years after the move but my grandmother, Ma enjoyed living nearby her only child. By the time I graduated law school both grandmothers lived in my parents’ home. And everything was fine for a good number of years. I began my legal career and, as is the case with many young lawyers, my family looked to me for answers to any and all legal questions. By the time I established my own firm in 1995 Imma was in her early 90’s and experiencing the tremors of Parkinson’s Disease. The onset of dementia soon followed and my parents eventually could not care for her at home any longer. They turned to me for help and so my own family became one of my first elder law clients. I struggled to navigate the same long term care and Medicaid system that we we now help so many of our clients with. But I persevered and we were able to get Imma care at a quality nursing home paid for under the Medicaid program. And a few years later we faced similar issues with Ma. When I discovered that my father was carrying her in the middle of the night to the bathroom I sat my parents down and explained to them the dangers of a 67 year old carrying a 92 year old over slippery floors down a dark hall. 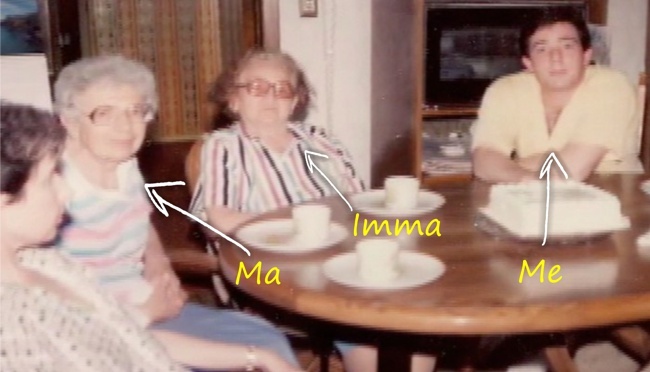 Ma’s hospitalization a short time later led to a move to assisted living . Back and forth trips to hospital and nursing home, an all too common occurrence for families these days, followed until she passed away at the age of 94. So it was that my own family’s experiences introduced me to elder law. As we move farther into the 21st century, and as 77 million babyboomers begin to turn 65, the issues surrounding the aging process and long term care will take on a more important role in many Americans’ lives. And we, at Hauptman & Hauptman, look forward to providing the same steady guidance and counseling to your family that I have provided to my own.